An Aboriginal cultural resource was developed to improve the hospital discharge journey of Aboriginal patients, families and carers in Mid North Coast Local Health District (MNCLHD). The clinical redesign process involved monitoring data, developing culturally appropriate resources and collaborating with Aboriginal people to gain the best health outcomes after discharge from hospital. To improve the hospital discharge journey of Aboriginal patients, families and carers in MNCLHD. Reduces confusion about the discharge process and enhances the satisfaction of patients, families and carers. Improves coordination and communication between MNCLHD, Aboriginal medical services, primary health networks and non-government organisations. Reduces hospital length of stay and the risk of readmission within 28 days. Provides culturally appropriate services and resources for Aboriginal people during and after discharge from hospital. Provides a discharge plan tailored to the needs of the individual patient and their family or carer. Prevents overuse, underuse or misuse of clinical interventions. Improves satisfaction for patients, hospital staff and external stakeholders. MNCLHD provides services on the lands of the Birpai, Dunghutti, Nganyaywana and Gumbaynggirr Nations, and is committed to Closing the Gap in Aboriginal health. Prior to the project, unplanned hospital readmission rates within 28 days of discharge was 11.4 per cent for Aboriginal people, compared to 6.8 per cent for non-Aboriginal people. Unplanned readmissions within 28 days is an important measure of the quality of care or treatment provided by a hospital and is listed as a performance indicator at a hospital, district and state level. There is evidence to suggest that improving the hospital discharge journey can reduce unplanned readmission rates within 28 days. Discharge planning links the care provided in hospital with services in the community. It ideally begins as soon as the patient is admitted and involves the patient, their family and carer. A discharge plan may include follow-up appointments, referrals to a general practitioner or community health service, medication information and more. By ensuring the patient and their family or carer understand what is required to achieve the best health outcomes during and after discharge, they are less likely to return to hospital unexpectedly. An audit conducted prior to the project found that hospital discharge resources did not reflect a partnership with the Aboriginal community, as they were computer-generated documents that required a high level of health literacy. Funding was obtained to develop an Aboriginal Wellbeing Hospital Discharge Booklet, which aimed to improve the discharge journey for Aboriginal people. The booklet was developed by a committee of stakeholders, including MNCLHD, Aboriginal medical services, Aboriginal health workers, primary health networks and Aboriginal people in the community. It is a culturally-appropriate resource that is provided to patients on admission and used throughout their hospital journey, then reviewed prior to discharge. It allows staff, patients, families and carers to document their questions and answers so they can refer to them once the patient is discharged from hospital. what help is available at home. Clinicians can use the booklet as an individual care plan and modify any aspects to meet the needs of the patient. It is designed to be used by people with low literacy levels and can be used by non-Aboriginal people, with the exception of Aboriginal hospital liaison officers who focus on Aboriginal patients and families. Sustained – The project has been implemented and is sustained in standard business. The project began in October 2014 and was implemented within 12 months. Evaluation of the booklets is ongoing and will be reviewed in consultation with staff, partners and community members in 2018. The booklet was promoted throughout MNCLHD at staff in-service education sessions and Aboriginal community events, including Close the Gap and NAIDOC days. The first print run of 2000 copies in 2014 was followed by a second print run of 2500 copies in 2015. 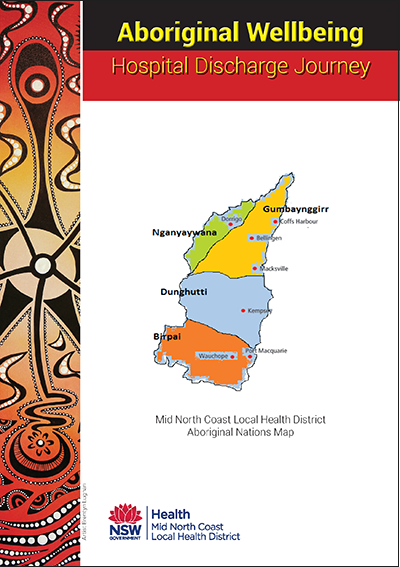 Since then, other local health districts have adapted the booklet for use by non-Aboriginal people and other case types. In 2016, MNCLHD achieved the highest result in the state in terms of involving patients in decisions about medications1. The project has also strengthened local partnerships with Aboriginal people, primary health networks and Aboriginal medical services. The ongoing use of the booklet and unplanned readmission rates continue to be monitored in MNCLHD, with a formal evaluation of the booklet due in 2018. A commitment to identifying gaps in service delivery and engaging key stakeholders was integral to the project. Strong communication between the project team and Aboriginal people in the community was vital for understanding the language, cultural beliefs, traditions and barriers to care. Trust and respect, as well as listening to feedback from the community, was important during discussions with stakeholders. Empowering patients to write in their booklet transformed it from a token gesture to a true partnership. Bureau of Health Information (BHI). Patient Perspectives: Hospital Care for Aboriginal People. Chatswood, NSW: BHI; 2016. Bureau of Health Information. Patient Perspectives: Exploring aspects of integration for hospital patients. Volume 1, Adult Admitted Patients, NSW Public Hospitals 2013. Chatswood, NSW: BHI; 2014.